SEE YOU AT SYDNEY INTERNATIONAL BOAT SHOW! 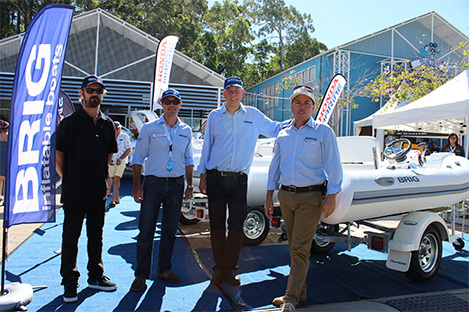 Sirocco Marine will have one of the largest displays of Rigid Inflatable Boats at the upcoming Sydney International Boat Show, 31 July to 4 August 2014. In fact, with more than 25 models in the BRIG range, Sealegs amphibious vessels, Williams Jet tenders, the unsinkable boston whaler boats and some boats from the Sirocco brand, Sirocco Marine will occupy nearly 700m², making it the largest single exhibitor at this year’s show. ‘Sydney is always an important show for us,’ says Australian distributor, Neil Webster, who with his team from Sydney, the Gold Coast, Perth and Melbourne will be on hand at SIBS to meet clients and answer any questions about the brands they represent. A massive selection of RIBs will be on show at Sirocco Marine, Stand 354 in Hall 3 and the adjoining stand 201 at the Sydney Exhibition Centre @ Glebe Island, the temporary home of the boat show for the next three years while the new Darling Harbour Convention & Exhibition is built. A free shuttle bus or ferry will take visitors from Cockle Bay, where the on water display will remain, to Glebe Island, running regularly each day of the show and taking around 20 minutes each way.